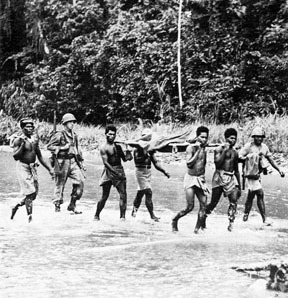 July 12 1944 We saw our first combat on Driniumor River in New Guinea jungle. Wade Lipscomb was first man killed on July 13. The night of July 15 William S. White from Florida was killed in the hole with me and William B. Carter from Collins MS. I got my helmet shot off my head but wasn't hurt all that much. We lost a number of good men that night. The moon was nice and bright but trouble never let up all night. I have never been as scared. Myself and John Billington from New Jersey took over the next morning. We were picked for scouts. We sure were lucky, we kept it from July 16 1944 and he was killed June 2 1945. Me and John went in July 16 and not knowing when, how or where. Only thing to do was go see. On the morning of July 22 the Japs hit us early and my pal was crippled so he was held back. When we move out to go in on them, they told me to stay on back of the line. We never went anywhere until it took a place. Then they sent word down the line for me to come on up. As I was going in they were coming out with Robinson, shot in his shoulder, he said, "Pat if you ain't lucky you won't live no time. They are waiting on you." I got in to head of the line there was Brewer shot down in an open place. He said, "Pat you will never get in there before they kill you. They are waiting for you." There it was, they got 4 of my pals in a short time. So there it was trouble again but as luck was with me. When I got in there only 18 men left. All gone but 18. So there I was, no chance of crossing that open terrain and a small chance when I got in there with them. Luck was with me, I got in there and got thru. It is easy to say what you would do. You can't say what you would do, after all maybe he never saw the front line. would do. You can't say what you would do, after all maybe he never saw the front line. Yes I saw blue days and blue nights. All you could hear was (pygmy)? and mole crickets. And that was a welcome happening. Blue days but someone had to face them so we boys had it to do. SGT. 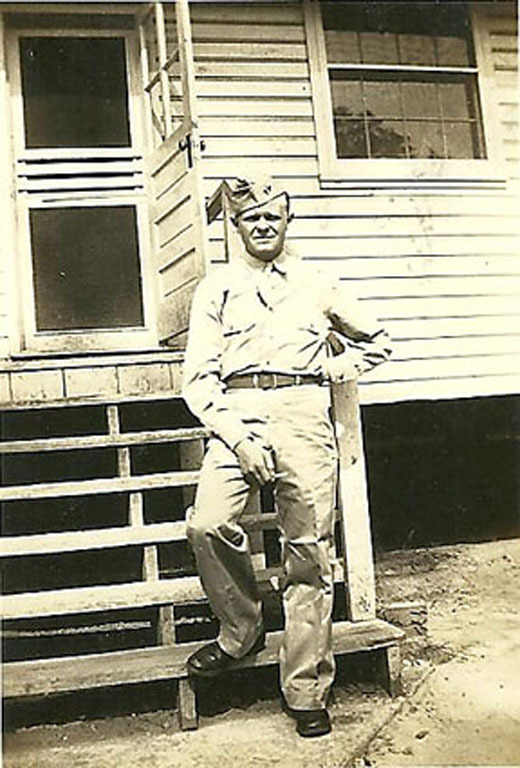 Fred Baker was shot 4 times in the head with a machine gun. Boy, was it rough and tough in them jungles. Me and some one and I can't think who, got him out where the boys could get him. We were in the New Guinea jungle. When we got back to Camp Shelby (Hattiesburg MS) Dec. 23 1945 he was there. He could not talk plain any more but he got by. It was rough and tough in there. We lost a lot of good men there. Some days were worse than others and no good days or nights. We put in on the Japs Marines(? ), tougher and the best they had and it wasn't a play house. We saw nights so dark you can't see your hand before your eyes. Put muddy water in your ears to cause a headache trying to stay awake. August 3 They sent a 30 man patrol across the river to stay overnight near a Jap hospital. We got about 3 miles up in the jungle, me, Holes (? ), Gattle (?) and John Billington in the lead. First thing we knew, we walked into a hornets nest of Japs, and lots of them. How many, no one knows. We fought our way out all though we got 13 men wounded. All were able to walk out. That is where I saw a friend was much more (valuable) than money. A friend is a friend even if it is on the front line. My friend saved my life that day. We got back to the river and crossed to our company for the night. The next morning we all went in there and boy it was rough and got rougher. We saw some sad days in there. We got up on Niumen creek, there is a mountain near the creek as in all that land. Trouble again and bad trouble. August 4th We went back up. It left me and John. (I believe this is Howard D. Goolesby) shot in his head (or could be hand). We sat there until August 7th and late in the afternoon we made a move to get on higher ground. It is almost night and still raining. They left me three more boys to bring up back of the line. The trail was wet and muddy, you could hear the Japs walking in the mud getting closer on us. It is us or them so we got it over. The rest of the night was still and raining. When we reached higher ground they told me I could get in a tree top and sleep. I was crippled up and beat down and was I glad to get a little sleep. That night Aug. 7 1944 how I know kill night before.(?). had a good eye and saw him open his eyes. He never told the tale. Them Japs had the nerve but it failed sometime to work. He was put there to see how many of us there was and how to come back at us. It is bad to try fighting your way through and hearing the wounded and to see some of them give it up and go on to rest and be left by the trail side which lots of our pals done. He crawled down the branch and got out on my side in a low place and threw mud at them. They shot at him. When I saw them, there was a machine gun and a bunch of rifles over on the other bank. Sad days again but it is us or them. my side in a low place and threw mud at them. They shot at him. When I saw them, there was a machine gun and a bunch of rifles over on the other bank. Sad days again but it is us or them. We move on our way. Before we got out, there was one Jap shooting at us from a tree on the trail. We got the other boys to put a helmet on a stick and move it across the trail. While he was watching them I went one way and John went the other way. The first thing the little man knowed we had our guns in his back. Before I got to the tree I saw two more in a hole sleeping. I moved their guns. We got the one from the tree and we got them. I can't see how anyone lived to get out of there. He had a hole in the roots of the tree shooting us through the hole. In my company I am in first platoon one day me and John was scouts until noon and then it landed to 2nd platoon for a scout in the afternoon. They put a boy from North Mississippi to scout with me that afternoon and I saw that wasn't my ole pal. We never went nowhere till his nerves were overloaded and in a short time I heard him crying. I asked him what was wrong and he wouldn't talk. Then I knowed what that meant. I saw it before. I put him back with the bunch. I had rather be by myself for a man is no good out there in that shape for it is suicidal any way when you are a scared. But this one thing I say to be true I think and that is I had as good a pal and as good a man and as good a scout for a man to work with. He was John Billington from New Jersey. He was 28 years old and weighed 128 pounds. He was little but he had the scouts eyes and his skills and it paid off in there. This may look like he was my only friend but that is not what I am talking about. I had lots of good friends in there. But John Billington from New Jersey was the only man to shake my hand and say I will die before I leave you wounded. "I will die before I leave you wounded." But if one is killed get out if you can so that is what we are to do but I come out of the hospital the day he killed. 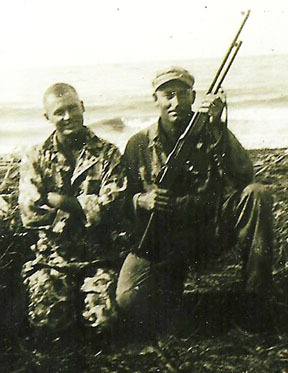 Me and John was out there a number of days and was looking to be killed or wounded at any time. We saw lots of our friends go down for they were called on. But for him that day come. He was wounded trying to take a pillbox. They got him out but as they carried him along he asked for his cap to be put over his eyes. They put it over them, that was all she wrote. On June 2nd 1945. (There was an old country song about a soldier's girlfriend writing to announce she was marrying someone else, the phrase 'that was all she wrote' was part of the chorus. It became a term depicting an end. 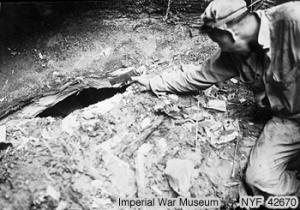 Me and 3 more boys was volunteered to go in the New Guinea jungle help bringing out some of another outfits wounded men. We got a man from Texas. He was almost dead he can't talk or move. We come to a branch of cold water and stopped to rest. I said he is a dead man but I am going to wash the blood and dirt off him and I did. After we got in the East Indies I was at a USO show and I was talking with some more boys. A man asked me if I ever saw him before and I said no. He took his shirt off and asked if I had ever saw them shrapnel scars before and I said no. He asked me had I ever help bring out a dead man and wash the blood and dirt off him. Yes I did. He said I the one you washed and that cold water sure hope me and I thank you for washing my face for it hope me a lot. He couldn't see, move nor talk but he knowed my talk. It was the same man I know for after he said what he did I knowed how he was shot. There was lots of men from close to home that I saw go down in there and went on to rest but a dead man. In there was easy to see, us or them. At this point Uncle Pat left a few pages blank then started again. From this point on they are out of New Guinea. When we left New Guinea we hit (I think this is Morotai) in the East Indies. That is where I felt my first earthquake. It wasn't a bad one but it shook the sand under your feet. I was on some loose dirt and jumped off but every thing was shaking, even my pants. (Morotai ?) weren't rough as the New Guinea jungles all through we lost some good men. They sure put the (unreadable) to us that weren't anything new to us boys, we heard them before. Some more blank pages were skipped then started again. Now they are entering the Philippines. What he seems to say about Morotai and hearing some untrue stories below does not make a lot of sense to me right now but I included it for further research later. This is where we boys made a beachhead. I come in ruff and tuff and tuff all the way through. That's where me and my buddies heard some untrue stories. Which we heard them before. Which it is a nerve raking job but some one had it to do. off shore so the 6 men hit the water and the Japs had barbed wire all in under the water and any thing to catch your clothes. They told me and John to go and the water was about 3 feet deep. Before we got to the beach it was over our head and John couldn't swim. I dragged him out to the beach. There has been a lot of good men's nerves ruined in such which has told on me. (Meaning it effected him) It wasn't every man that would stand up at such. After that one pillbox was taken and all got on the beach we felt better. We had the same chance that they had. Us boys were up for some rough and sad days. John Billington was better known on the front line as Combat. He is as good of a combat man as the US Army had I think. I don't say he is the best but I say he is one of the best combat men over there. How I know what he was doing, I was with him and seeing what was going on. He was my right hand man on the front line and a ? brother of mine. Me and John was to die before we left one wounded but if one was killed get out if you can. I think he meant that, just what he said. I had an ole pal that was with him and told me all about how he was wounded and how he died. A man in that shape and hoping me good luck and come home alive. I will never forget him. And that is just him. I got out of the hospital the day he was killed knowing I would go on the front line the next day. I got me and John some stuff to eat and drink when I overtook him. I knew we lost 4 of our men but not knowing who. The next day some of us went back up, we were going to stay overnight at a field hospital and go on up the next morning. We got to the hospital and met Lt. Black. He told me, "we lost Combat." We stayed over at the hospital. The next morning they sent me to my company. The next day I went back into the hospital. When I got out the war was almost over. I was gone that time 2 months before I got back to my company. When I got back to my outfit that time I had a very good time and very little to do. 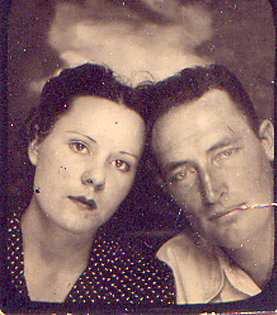 I think at times for a little rest me and John had a slim chance from July 16, 44 until June 2, 45. That is the day he was killed so the way it worked my and his combat days were over. John came into my company at Camp Pickett VA. Me and him was a close friend from then on. He was killed trying to take a pillbox where L company had failed. He was wounded and they got him out. As they carried him along he asked for his cap to be put over his face. As they did, so that was all she wrote. It is my understanding Uncle Pat had lost it by the time he got back to his company. After he got home he would have chills and couldn't stand noise like shooting or fireworks. Being Christmas someone set off some fireworks and he ran and got under a bed. No man should ever have to suffer such especially because wars are only the result of someone's ambition to forcibly take power or material goods from someone else. Pat Bullock with Rosilee Walters. If anyone has any additional information or corrections please contact the editor. All input is valuable. to make America seem like the "Good Old Promised Land;"
If all the world were like you, What would the people do?